Nosema disease is one of the most important diseases of adult honey bees worldwide. It is known as silent killer because there are no characteristic symptoms. The aim of the present study was to determine prevalence of Nosema species in various towns of Kurdistan province in Iran. A multiplex polymerase chain reaction (multiplex-PCR) was performed for identification of Nosema species infecting European honeybee, Apis mellifera. A total of 100 samples were collected from apiaries (870 hives) in 10 counties of Kurdistan province, located in the west of Iran. Samples were examined using light microscope and PCR. The light microscope was used to determine the presence of Nosema spores in all of the collected samples. Multiplex-PCR based on 16S ribosomal RNA was used to differentiate N. apis from N. ceranae. Overall prevalence of the microscopic evaluation and PCR method were 29.00% and 32.00%, respectively. The analysis of Nosema isolates from interrogation of DNA databank entries of Kurdistan apiaries (based on rRNA sequence data) indicated that only N. ceranae was widespread in these apiaries, and it had already been found in high percentages (50.00%) in Marivan and Kamiaran counties of Kurdistan province. It was shown that only N. ceranae was found by PCR assay in the region. Fries I. Nosema ceranae in European honey bees (Apis mellifera). J Invertebr Pathol 2010;103 (S1): S73-79. Matheson A. World bee health report. Bee world 1993;74(4):176-212.3. Zander E. Animal parasites as pathogens in the bee [German]. Münchener Bienenzeitung 1909;31:196-204. Fries I, Feng F, da Silva A, et al. Nosema ceranae n. sp. (Microspora, Nosematidae), morphological and molecular characterization of a microsporidian parasite of the Asian honey bee Apis ceranae (Hymenoptera, Apidae). Eur J Protistol 1996;32(3):356-365. Huang W-F, Jiang J-H, Chen Y-W, et al. A Nosema ceranae isolate from the honeybee Apis mellifera. Apidologie 2007;38(1):30-37. Paxton RJ, Klee J, Korpela S, et al. Nosema ceranae has infected Apis mellifera in Europe since at least 1998 and may be more virulent than Nosema apis. Apidologie 2007;38(6):558-565. Chen Y, Evans JD, Smith IB, et al. Nosema ceranae is a long-present and wide-spread microsporidian infection of the European honey bee (Apis mellifera) in the United States. J Invertebr Pathol 2008;97(2):186-188. Chen YP, Huang ZY. Nosema ceranae, a newly identified pathogen of Apis mellifera in the USA and Asia. Apidologie 2010;41(3):364-374. Klee J, Besana AM, Genersch E, et al. Widespread dispersal of the microsporidian Nosema ceranae, an emergent pathogen of the western honey bee, Apis mellifera. J Invertebr Pathol 2007;96(1):1-10. Fries I, Martín R, Meana A, et al. Natural infections of Nosema ceranae in European honey bees. J Apic Res 2006;47(3):230-233. Higes M, Martin-Hernandez R, Meana A. Nosema ceranae in Europe: An emergent type C nosemosis. Apidologie 2010;41(3):375-392. OIE. Nosemosis of honey bees. OIE terrestrial manual: OIE 2013:1-6. Tapaszti Z, Forgách P, Kövágó C, et al. First detection and dominance of Nosema ceranae in Hungarian honeybee colonies. Acta Vet Hung 2009;57:383-388. Bourgeois LA, Rinderer TE, Beaman LD, et al. Genetic detection and quantification of Nosema apis and N. ceranae in the honey bee. J Invertebr Pathol 2010;103(1):53-58. Cox-Foster DL, Conlan S, Holmes EC, et al. A metagenomic survey of microbes in honey bee colony collapse disorder. Science 2007;318(5848):283-287. Martín-Hernández R, Meana A, Prieto L, et al. Outcome of colonization of Apis mellifera by Nosema ceranae. Appl Environ Microbiol 2007;73(20):6331-6338. 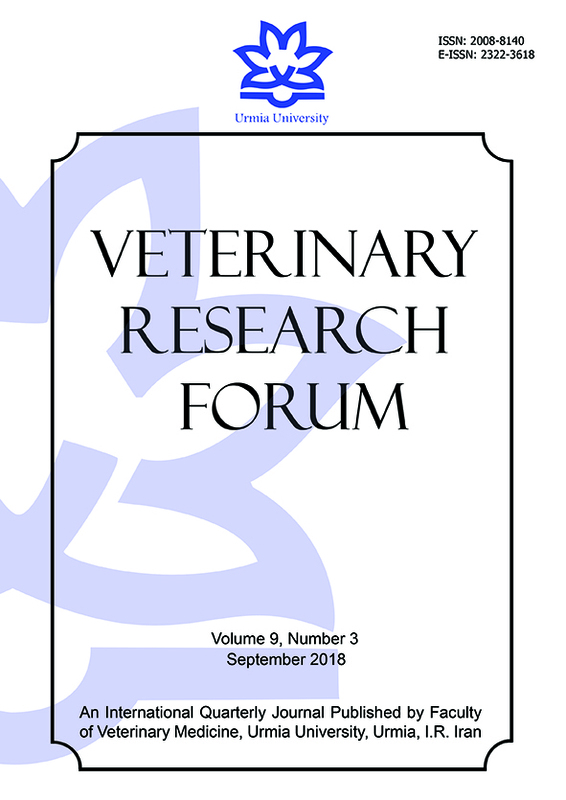 Bokaie S, Sharifi L, Mehrabadi M. Prevalence and epizootical aspects of varroasis in Golestan province, northern Iran. J Arthropod Borne Dis 2014;8(1):102-107. Fries I, Chauzat MP, Chen YP, et al. Standard methods for Nosema research. J Apic Res 2013;52(1):1-28. Hall T. BioEdit: An important software for molecular biology. GERF Bull Biosci 2011;2(1):60-61. Lotfi AR, Jamshidi R, Aghdam Shahryar H, et al. The Prevalence of nosemosis in honey bee colonies in Arasbaran Region (Northwestern Iran). Am Eurasian J Agric Environ Sci 2009;5(2):255-257. Modirrousta H, Moharrami M, Mansouri MA. Retrospective study of the Nosema ceranae infection of honey bee colonies in Iran (2004-2013). Arc Razi Ins 2014;69(2):197-200. Nabian S, Ahmadi K, Nazem Shirazi M, et al. First detection of Nosema ceranae, a microsporidian protozoa of European honeybees (Apis mellifera) in Iran. Iran J Parasitol 2011;6(3):89-95. Tavassoli M, Eiganinejad S, Alizadeh-Asl S. A survey on Nosema apis infection in apiaries of Urmia, North-West of Iran. Iran J Vet Sci Technol 2010;1(1):35-40. Razmaraii N, Karimi H. A survey of Nosema disease of honey bee (Apis mellifera) in East Azarbaijan province of Iran. J Anim Vet Adv 2010;9(5):879-882. Aroee F, Azizi H, Shiran B, et al. Molecular identification of Nosema species in provinces of Fars, Chaharmahal and Bakhtiari and Isfahan (Southwestern Iran). Asian Pac J Trop Biomed 2017;7(1):10-13. Davoudi J, Naderi A, Mohammadpour F, et al. Study of infection rate of suburb bee hives to parasites nosema apis, varroa spp. and acarapis woodi in Miyaneh, Iran. J Now Agric Sci 2009;4(13):39-43. Botias C, Martin-Hernandez R, Garrido-Bailon E, et al. The growing prevalence of Nosema ceranae in honey bees in Spain, an emerging problem for the last decade. Res Vet Sci 2012;93(1):150-155. Williams GR, Shafer AB, Rogers RE, et al. First detection of Nosema ceranae, a microsporidian parasite of European honey bees (Apis mellifera), in Canada and central USA. J Invertebr Pathol 2008;97(2):189-192. COLOSS. Nosema disease: lack of knowledge and work standardization. COST Action FA0803 - Prevention of honeybee colony losses. Guadalajava, Spain 2009:1-39. Higes M, Martín Hernández R, García Palencia P, et al. Horizontal transmission of Nosema ceranae (Micro-sporidia) from worker honeybees to queens (Apis mellifera). Environ Microbiol Rep 2009;1(6):495-498. Higes M, Meana A, Bartolomé C, et al. Nosema ceranae (Microsporidia), a controversial 21st century honey bee pathogen. Environ Microbiol Rep 2013;5(1):17-29. Higes M, García-Palencia P, Martín-Hernández R, et al. Experimental infection of Apis mellifera honeybees with Nosema ceranae (Microsporidia). J Invertebr Pathol 2007;94(3):211-217. Martín Hernández R, Botías C, Bailón EG, et al. Microsporidia infecting Apis mellifera: coexistence or competition. Is Nosema ceranae replacing Nosema apis? Environ Microbiol 2012;14(8):2127-2138. Martínez J, Leal G, Conget P. Nosema ceranae an emergent pathogen of Apis mellifera in Chile. Parasitol Res 2012;111(2):601-607. Budge G, Powell M, Roberts K, et al. What has Nosema got to do with losses? Monitoring both Nosema species in the UK. In: Kence M (Ed). 4th European Conference of Apidology. Ankara, Turkey 2010:47. Gisder S, Hedtke K, Mo¨ckel N, et al. Five-year cohort study of Nosema spp. in Germany: Does climate shape virulence and assertiveness of Nosema ceranae? Appl Environ Microbiol 2010;76(9):3032-3038. Bermejo FJO, Fernández PG. Nosema disease in the honey bee (Apis mellifera L) infested with varroa mites in southern Spain. Apidologie 1997;28:105-112. Pajuelo AG, Torres C, Bermejo FJO. Colony losses: A double blind trial on the influence of supplementary protein nutrition and preventative treatment with fumagillin against Nosema ceranae. J Apic Res 2008;47:84-86. Runckel C, Flenniken ML, Engel JC, et al. Temporal analysis of the honey bee microbiome reveals four novel viruses and seasonal prevalence of known viruses, Nosema, and Crithidia. PLoS One 2011;6(6):e20656. Bailey L. The epidemiology and control of nosema disease of the honeybee. Ann Appl Biol 1955; 43:379-389. Martín-Hernández R, Meana A, García-Palencia P, et al. Effect of temperature on the biotic potential of honeybee microsporidia. Appl Environ Microbiol 2009;75(8):2554-2557.